PREMIER INN has launched a new hotel concept, which aims to provide visitors with the UK's most space-efficient and digitally savvy rooms. hub by Premier Inn will have ingenious storage solutions in every nook and cranny and state of the art digital technology - for guests who value location, price and design over space. Each room is kitted out with an en suite bathroom with power shower, wardrobe, desk, Hypnos pocket-sprung bed, free Wi-Fi and a 40" inch smart screen TV - all neatly fitted into just 11.4msq. It will also be the UK's first hotel where the rooms can be remote controlled using a smart phone app. Guests will be able to check in online and control the room's lighting, temperature and even what will be on the TV or radio when they arrive. The new brand will target major UK city centres and the first hub will open in London's West End next summer. 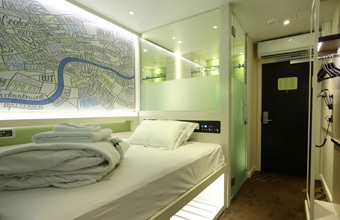 Rooms will be, on average, up to 30 per cent cheaper than a comparable Premier Inn in Central London.